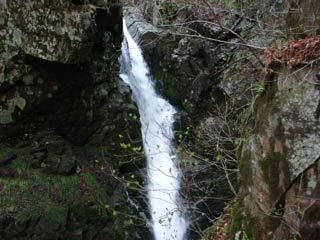 Maya Falls (摩耶の滝) is a waterfalls located in Shima Onsen, Gunma Pref. It is about 20m tall, and located in a deep mountain side of Shima Onsen. This waterfalls is also known as much making waterfalls. There are bells for avoiding wild bears. When you see them, ring them to aware bears that you are there. Bears will escape when they heard that bells. There is no parking. Maya Falls was named after the princess Maya. Because Maya found her bride at this waterfalls according to the guidance of Fudo, this falls was named Maya. After that, this falls became famous for match making waterfalls.